I went to bed hopeful, and excited about my race in the morning (despite having an awful sinus infection / chest cold). I woke up to dog paws tapping the wooden floor. My alarm clock had been going off for about 15 minutes. But Willard (my friend’s adorable dog) wanted to make sure I woke up on time for our marathon relay. He started barking and then banging his head on the door. Willard didn’t want me to oversleep. I pulled myself out of bed and opened the door. Willard was starring right up at me. “How are you feeling, lady?” Carla asked me as I walked into the bathroom. I coughed, sneezed three times, and then blew my nose. “Better, I think!” I said back. “I think you’re a good liar,” Carla said back. She was right. I felt awful. And I honestly thought about trying to find someone else to run for me. But after the Boston events, I found myself more determined than ever to participate in the race. I proudly put on my “Running for Two” t-shirt (one of my many layers) and placed on my bib. We had a late start, but we sill managed to pick up everyone, find a good parking spot, and be at the start line in time for the race to begin. We found ourselves struggling to keep warm. Carla kept refreshing her iPhone to see if the weather temperature would change. Running in cold weather is a challenge. And running in cold weather with a head cold is even harder. We took a group picture before parting ways. Me, Jami, Robyn, and Carla. I managed to sneak back up to the start line and watch Jami kick off the relay for us. I couldn’t find her at first, but I saw her toward the middle of the pack. ‘YAHHHH JAMI!” I yelled from the sidelines. She turned over to see me and got a giant smile on her face. I don’t think she was expecting anyone to come cheer her on. Because Jami had a giant smile on her face. Because I love seeing people be active and care about their fitness. Because I thought about Jenna’s post from the night before. And mainly, I cried because I’m pregnant. Spoiler alert: I cried about 30 times at the race. After everyone Jami kicked off the race and everyone parted ways, I was left with my group of Leg 4 runners. I overheard two woman chatting next to me about the many marathons they’ve done over the years. I was surprised at how many other runners turned around to congratulate me on my pregnancy + compliment me for being so active during my pregnancy. I learned more and more about the runners next to me. Most of them were FAST. One girl said she was injured, but hoping for a slower pace of 6:30 minutes per mile. Try doubling that and then you have my average pace. The bus of shame = the trolly that drives around picking up runners who are going too slow. I got to my starting point around 9 am, which meant I had about three hours before I would run. I spent the time catching up on supporting text messages from my amazing friends and family, Facebook stalking, trying to predict my finish time, and chatting with the runners around me. Eventually, I realized the marathon runners were passing by so I stepped outside to cheer them. This is when I started to cry again. 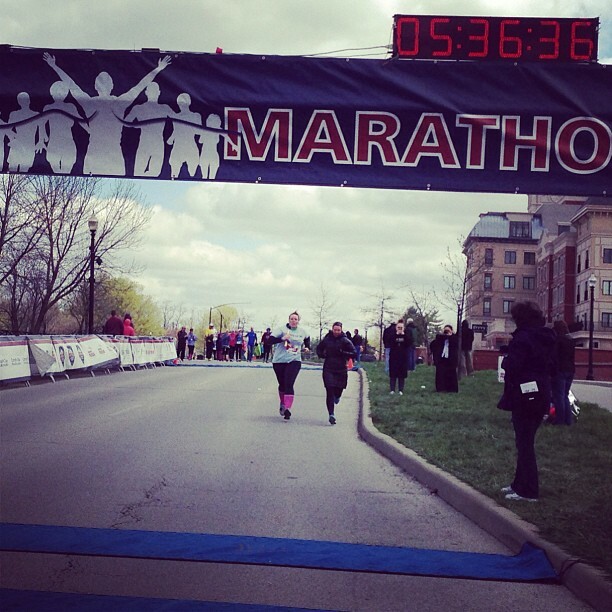 The courage and strength it takes to complete a full marathon is so inspiring. I tried to look every single runner in the eyes and say something uplifting to them. 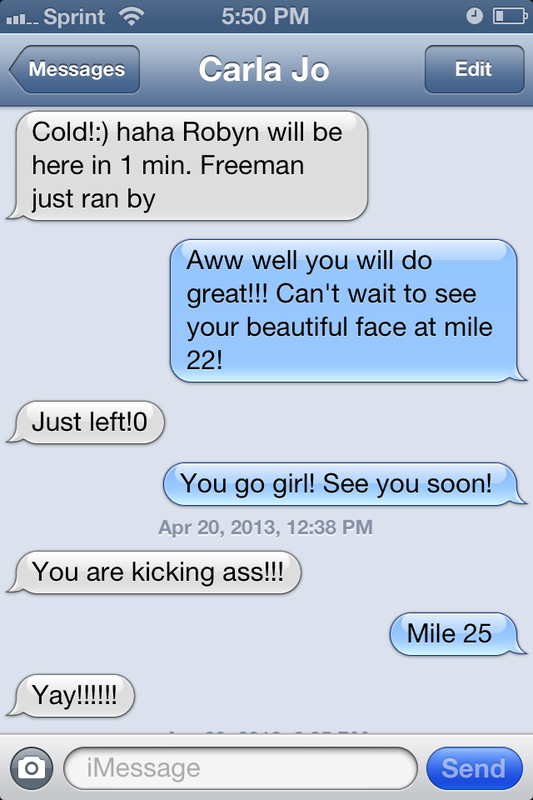 I wanted them to know how amazing they are…how strong they looked…I’ve often heard that hitting mile 22 is the hardest. You feel so close, yet so far away. So I felt I had an obligation to give every runner a boast of inspiration and support to finish strong. And I found myself getting SO mad at the people / other relay runners standing around not cheering for the marathoners passing by… some of these marathoners were in pain – whether it be physical or emotional- and the best thing we can provide them is support and inspiration. I started cheering loudly and recruited the people around me to cheer on the other runners. I wanted to yell at everyone for being jerks and just sitting around on their phones. Some people were standing on the course, which made marathoners have to dodge around them…instead of making a huge scene and screaming- I got tears in my eyes and cheered louder for the inspiring runners ahead of me. The smiles and “thank yous” I received from the runners made my loud cheers completely worth it! Eventually, I saw Carla running up to the relay exchange. She looked strong! I was SO proud of her and her amazing pace. In fact, I later learned that everyone had a fantastic pace – PR worthy paces! “I had to run an extra mile,” Carla said. I took off running and waved goodbye to the mini cheering section I had created. About 2 minutes into my run, I hated life. I questioned why I was even running in the first place. 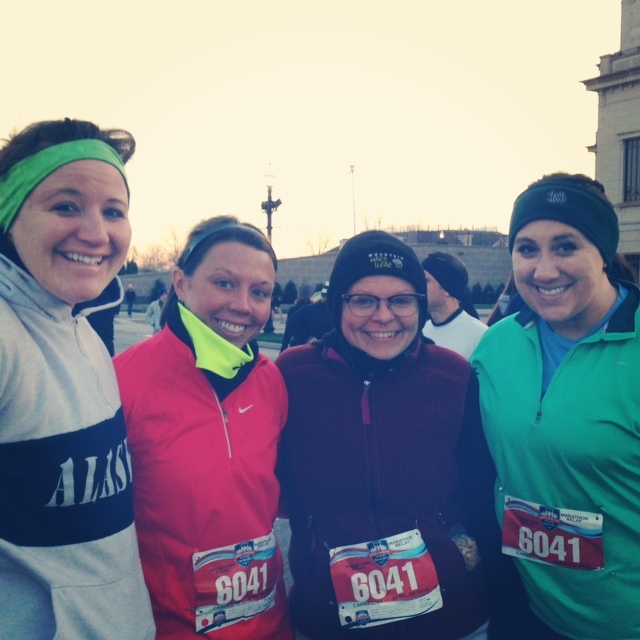 My legs were tight from standing up and yelling the cold weather, despite my efforts to jog in place and stretch. My nose was cold and raw from blowing it 100 million times over the past few days. My chest was heavy, which made breathing hard. I stopped for a walking interval and a runner passed me. Even though I was walking, which implies to some that I’ve given up, the marathoner turned and smiled. He was an older man. Probably about 69 years old. I promised myself that I would thank encourage every single runner who passed me. And I would thank every single volunteer, spectator, and police officer that I saw on the course. Cooper was definitely my running buddy / internal cheerleader. I kept doing intervals of power walking and running. But I did more power walking than running. I was getting frustrated that I didn’t see any mile markers. Eventually, I came across another water station. It was down hill so my speed REALLY picked up and I felt awesome. Every single volunteer at the water station started cheering and yelling for me. I could barely get the words, “Thank you” out of me. One man commented on my shirt and I told him that I was five months pregnant that day. I couldn’t stop laughing and they inspired me to start running again. I tossed my cup and took off running toward the mile marker sign – the first one I’d seen since I started. I fought up a hill and a few police officers started cheering me on because I stopped to walk. He, like so many others, complimented me for running while pregnant. I started crying (obviously), thanked him (like I did all the other police officers), and continued running. About that time, I saw Jami standing on the right corner. She saw me coming and started jumping up and down while yelling my name. When I reached her, she started to run with me, but I had to stop to catch my breath. Even though I stopped to walk, her positive energy and support was EXACTLY what I needed. I can’t explain how thankful and happy I was that Jami spent that last half mile by my side. We power walked for a few blocks. Jami was a few steps ahead of me to push me to keep fighting through the pain. We chatted about her section of the race, which was her best ever, and that made me very happy. She encouraged me to keep running or walking at whatever pace I needed. We reached a certain point and I started running again. 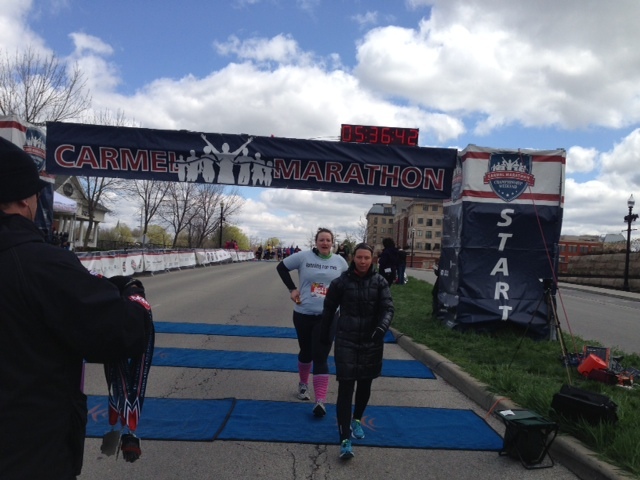 “The finish line is up that hill and around the corner,” Jami said. “How far away would you say?” I asked. We picked up the pace and started to run again. “I DON’T WANT TO STOP,” I screamed, frustrated with my sick body. I stopped for about 30 seconds to catch my breathe and we started running around. I just wanted to take my mind off the pain. “You’re almost done,” Jami said. “I am mother,” I said. I could see my relay teammates cheering for me and I had Jami by my side. I started repeating “I am a mother” in my head and then we took off sprinting toward the finish line. I am pretty sure I coughed and then peed my pants at this point. Oh, the joys of running + being sick while pregnant. You’re welcome for the laugh. A few minutes later, a volunteer wrapped a medal around my neck. 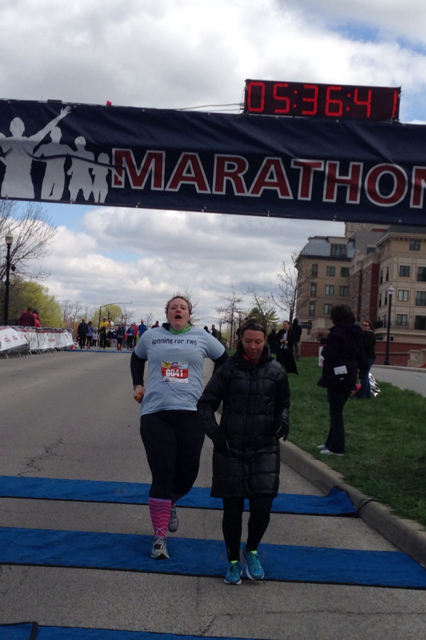 I turned around to see a marathoner who had been walking toward the finish line with a group of family and friends. I think she got injured on the course. I turned around when I heard everyone cheering. She crossed the finish line and put her hands in her face. She started crying. And obviously, I started crying for her. 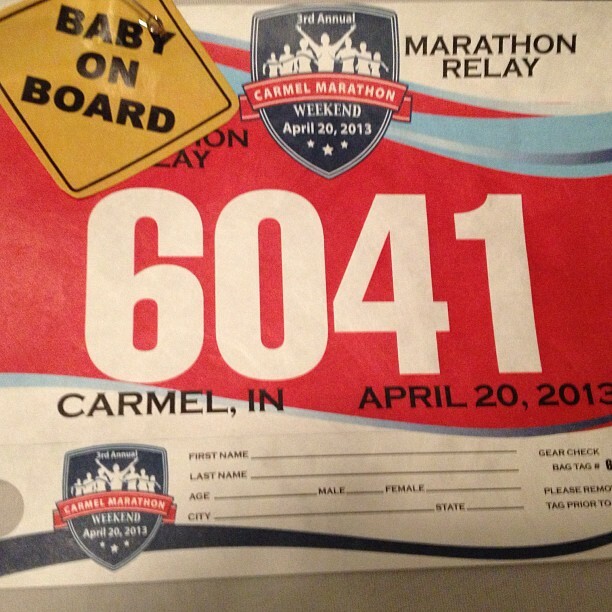 The Carmel Marathon Relay was my best-worst race. It was the best race because of the random cheerleaders, amazing teammates, and having Cooper with me the entire time. And it was the worst race from a time perspective. I’m not sure what my finishing time was, but I am sure it was close to an hour. But, some races aren’t meant to be personal bests. And this race, while I was slower than usual, was a very memorable race. Thank you for all the love and support! I couldn’t have finished (or even got to the start line) without the encouraging words and inspiration from each and every single one of you!